The new paintings on view act as mirrors, reflecting McEneaney’s core identity as an artist and activist and continuing her ongoing investigation of autobiography in her work. 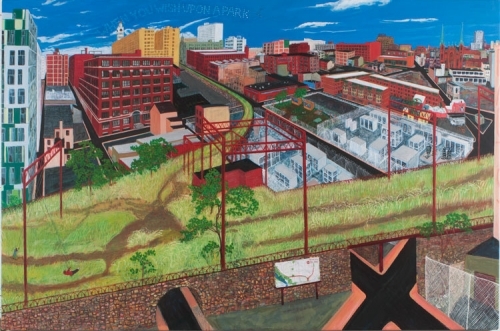 A founding member of the Friends of the Rail Park, a nonprofit group involved in Philadelphia’s Rail Park development—which has changed the landscape of her neighborhood and others throughout the city—McEneaney paints the shifting cityscape as seen from her surroundings. The artist’s depictions of the viaduct’s transformation and the changing architecture of Trestletown act as an extension of her self portraiture, situating her life as an artist within the larger life of the city. The exhibition will be accompanied by a publication, with an essay by critic and writer, Wendy Vogel, which traces a new familiarity in the most intimate depictions of McEneaney’s daily life. McEneaney, a graduate of the Pennsylvania Academy of the Fine Arts has had two previous solo exhibits at Locks Gallery. Recent group exhibitions include Happiness, Liberty, Life? American Art and Politics, Pennsylvania Academy of the Fine Arts (2016); About Face: Self Portraiture in Contemporary Art, Hood Museum of Art (2015) and First Look, The Philadelphia Museum of Art (2013). Her work is in such museum collections as the Hood Museum of Art, Mills College Art Museum, Neuberger Museum of Art, RISD Museum, Philadelphia Museum of Art and Pennsylvania Academy of the Fine Arts. The artist has received multiple awards; including a Chinati Foundation Residency, Yaddo Fellowship, Pew Fellowship in the Arts, Joan Mitchell Foundation Grant and the inaugural residency with the Joan Mitchell Center in New Orleans.